Here's another card I made with the new Lots of Love Digikit by Hero Arts. I really love this kit. And when I saw it, I immediately had the idea of making a sort of bouquet of hearts. :) I printed the hearts onto white paper, then stamped with one of my favourite new stamps, Envelope Pattern, then inked the edges. I tied it together with some yummy silk ribbon from The Ribbon Girl. I hope you are enjoying your weekend. It's a cold but gorgeous day here. Lovly sunshine. And best of all, my new studio is built! We are painting at the moment, waiting for the flooring, and shopping for furniture. Ikea tonight I think! So excited to share pictures when it's done. Very pretty. Can't wait to see your new studio. How exciting for you. I'm so excited for you to have your own space!! Can't wait to see how it turns out. 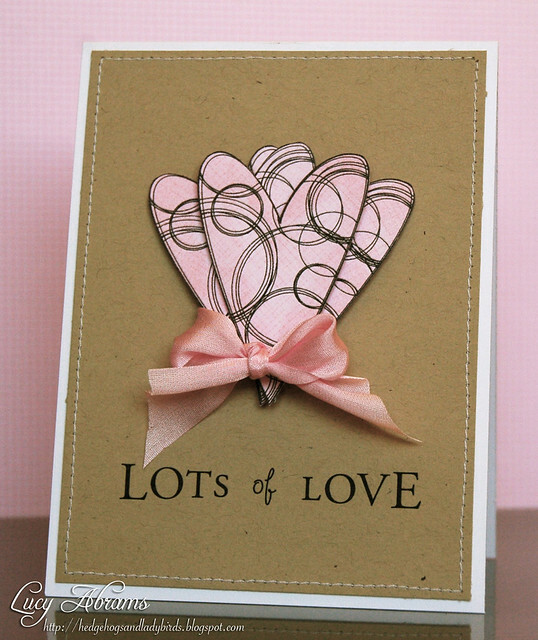 LOVE your idea of a bouquet of hearts! This is b-e-a-u-t-i-f-u-l. First Class. Lovely and sweet card. I love your cards Lucy! I envy you for your creativity. haha. LOVE this, Lucy! I'm excited for your new craft room/studio!! YAY! Can't WAIT to see your craft space, Lucy! Hurry and get it done, would ya!? :) Love your card today! Those layered hearts are fabulous! saw this over at 2Peas and it is so pretty. I love the pink with Kraft colour scheme Lucy... just perfect.... My hubby is in London at the moment and said it is VERY COLD... we are having temps up in the mid-high 20's here in NZ ~ hope spring is not too far away for you! Lucy . . . this is so amazing. Love how stunning it is but yet how simple, too. Gorgeous. Another fabulous creation like the layered hearts that you've stamped. Also can't wait to see pics of your new studio so we can all swoon over it! !